As a company listed in Singapore , ATON Innovation Group specialized in plastic pipes and fittings since 1994, with the strength of production category and specification completed and diversified. Our main products include PVC-U, PP-R, and PE pipes and fittings, PVC-U windows and doors, telecommunication ducts, PE fuel gas, etc. · Healthy, bacteriological neutral, conforming to drinking water standards. 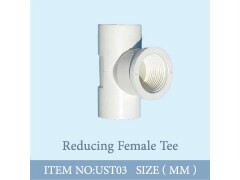 · Complete specifications of pipes and fittings, which can meet many requirements of various designs and installations.